First off, thanks guys for your suggestions about my bay window. I am not much of a green thumb, but I will put some plants there and hopefully they will survive! I will upload a picture when I get around to doing it. Thanks again! So, I made that skirt for Kate the other day. It makes me happy. It makes her happy too, as I can't seem to keep it off her! As I write, she is changing into it. I am glad she likes it. I made one small mistake but thats ok, you cant see it. 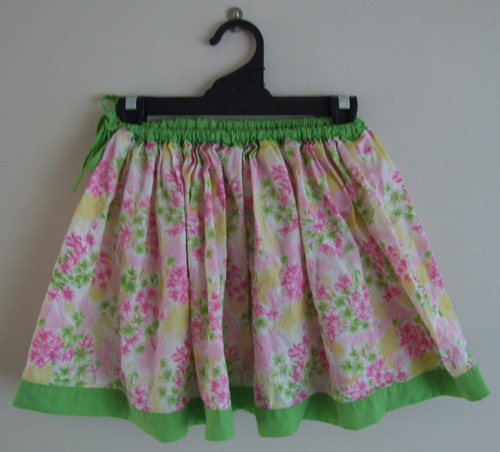 If anyone else is going to make the skirt and you have overly skinny children, you wont need the width as big. I have found that along the elastic it is too bunch and bulky. If I make her another one, which I probably will as it was so easy and I made it in one day, I will reduce the width. Luke was so excited the other week, he received his first official party invitation! Kate gets them from the other kids at school and he would always get upset when he couldn't go with her to the party. Understandable really. So he has been eagerly awaiting this day. We put the invitation on the fridge and we went out and bought the present together. So when today came along he was very excited! It was at the Wiggles indoor playcentre at Seven Hills. I had not even heard about it before! It was a fun day and he didn't want to go home, but I think he was buggered so went without a fight, thank goodness! Ohhh Charlotte would love one of these skirts, maybe when she is older. Loves having a good dance and twirl with Hi-5. Hope you have a fabo weekend, and I want to see some work from you. That skirt looks gorgeous Beth, glad that Kate loved it. Sounds like Luke had a great time.